The Etiwanda High School Bands and Color Guard programs are able to operate because of donations made by families, friends, and supporting businesses. Without support, we would not be able to offer our students the quality programs that have instilled life-long values helpful to building strong adults. 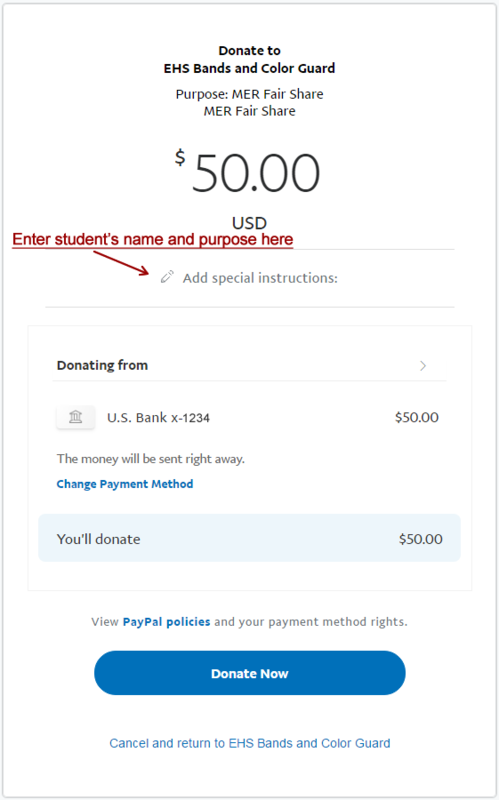 On this page we offer the ability to make fair share donations as well as submit payment for various fundraisers and clothing sales using PayPal. Be sure to select the correct button below to ensure your payment is directed to the right event. Send payment to the band box in the EHS band room (we accept checks or money orders made payable to EHS Bands, or cash). Make sure you designate the student associated with the payment as well as the purpose for the payment (e.i. - fair share donation, clothing, Pancake Fundraiser, tickets to an event, etc). Send payment to the booster PO Box 327, Etiwanda, CA 91739. Make sure you designate the student associated with the payment as well as the purpose for the payment (e.i. - fair share donation, clothing, Pancake Fundraiser, tickets to an event, etc).